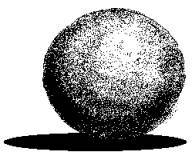 An element of art used to define shape, contours, and outlines; also to suggest mass and volume. It may be a continuous mark made on a surface with a pointed tool or implied by the edges of shapes and forms. Outlines- Lines made by the edge of an object or its silhouette. Contour Lines- Lines that describe the shape of an object and the interior detail. Gesture Lines- Lines that are energetic and catch the movement and gestures of an active figure. Sketch Lines- Lines that capture the appearance of an object or impression of a place. Calligraphic Lines- Greek word meaning "beautiful writing." Precise, elegant handwriting or lettering done by hand. Also artwork that has flowing lines like an elegant handwriting. Implied Line- Lines not actually drawn but created by a group of objects seen from a distance. Implied line is the direction an object is pointing to, or the direction a person is looking at. 1. Below are five boxes. Create a different type of line for each box. 2. In the blank under the box come up with a name for that line that describes it. Color comes from light - if it weren’t for light, we would have no color. Light rays move in a straight path from a light source. Within this light, rays include all of the colors in the spectrum or rainbow. Shining a light into a prism will create a rainbow of colors because it separates the color of the spectrum. When the light rays hit an object, our eyes respond to the rays that are reflected back and we see only the reflected color(s). For example, a red ball reflects all the red light rays. As artists, we use pigments in the form of powder or liquid paints to create color. Primary Colors - Red, Yellow, and Blue. These colors cannot be mixed, they must be bought in some form. Secondary Colors - Orange, Violet, and Green. These colors are created by mixing two primary colors. Intermediate Colors - Red Orange, Yellow Green, Blue Violet, etc. ; mixing a primary with a secondary creates these colors. Complementary Colors - Colors that are opposite each other on the color wheel. When placed next to each other they look bright and when mixed together they neutralize each other. Color Harmonies are certain combinations of colors that create positive looks or feelings. Analogous Colors are colors that are next to each other on the color wheel. Examples include red, red orange, and orange. Triadic Harmonies are three equally spaced colors on the color wheel. For example, yellow, Red, and Blue are a triadic harmony color scheme. Monochromatic is one color used with different values and intensity. For example, light brown, brown and dark brown are monochromatic colors. Warm colors are on one section of the color wheel and give the felling of warmth. For example, red, orange, and yellow are the colors of fire and look warm. Cool colors are on the other side of the color wheel from the warm colors. They give the feeling of coolness. For example, blue and violet are the colors of water, and green is the color of cool grass. On the back of this sheet of paper create a color wheel. Be sure to include the primary, secondary and intermediate colors. Use colored pencils to create your colors. Shape: When a line crosses itself or intersects with other lines to enclose a space, it creates a shape. Shape is two-dimensional and has height and width, but no depth. Geometric Shapes - Circles, Squares, rectangles, and triangles. We see them in architecture and manufactured items. Organic Shapes - Leaves, seashells, and flowers are organic shapes. We see them in nature and they have free flowing, informal and irregular characteristics. Positive Shapes - In a drawing or painting, positive shapes are the solid forms (positive space) in a design such as a bowl of fruit. In a sculpture, positive shapes are solid areas of the sculpture that remain after removing portions of the sculpture. Negative Shapes - In a drawing or painting, the space around the positive shape is negative space. Negative space can form a shape when it meets a positive shape. Negative space can include the sky or spaces between objects. In sculpture, the negative space is the portion that is removed from a sculpture. The negative space can become a shape when it meets the positive form of the sculpture. Static Shapes - Shapes that appear stable and resting. Dynamic Shapes - Shapes that appear to be moving and active. In these two boxes below, draw the same picture in each box. In the first box, shade the positive space and in the second box, shade the negative space. Negative space surrounds a sculpture or object. A person can walk around sculptures and objects, look above them, and enter them. Space refers to the space inside, around, and above a sculpture or object. A three-dimensional object with positive space will have height, width, and depth. Space in a two-dimensional drawing or painting refers to the arrangement of objects on the picture plane. The picture plane is the surface of your drawing paper or canvas. You can have a picture plane that is a crowded space with lots of objects or an empty space with very few objects. A two-dimensional piece of art has height and width but no depth. The illusion of depth can be achieved by using perspective. Perspective is the technique that is used to create the illusion of depth in your picture. Perspective makes your picture look like it is moving to the distance like in a landscape or cityscape. Positive space – Similar to a positive shape, it is the actual sculpture or building. Negative space – Similar to a negative shape, it is the space around the sculpture or building. Picture Plane is the flat surface of your drawing paper or canvas. Composition is the organization and placement of the elements on your picture plane. Focal Point is the object or area you want the viewer to look at first. Nonlinear Perspective is the method of showing depth that incorporates the following techniques. Position – Placing an object higher on the page makes it appear farther back than objects placed lower on the page. Overlapping - When an object overlaps another object it appears closer to the viewer, and the object behind the object appears farther away. Size Variation - Smaller objects look farther away in the distance. Larger objects look closer. Color - Bright colors look as if they are closer to you and neutral colors look as if they are farther away. Value - Lighter (not brighter) values look as if they are farther back and darker values look as if they are closer. For example, in a landscape the mountains often look bluish and lighter than the trees or houses that are closer to you. Linear Perspective is the method of using lines to show the illusion of depth in a picture. The following are types of linear perspective. One-point perspective - When lines created by the edge of an object or building look like that are pointing to the distance and these lines meet at one point on the horizon. To see an example, stand in the middle of the hallway and look at the horizontal lines in the brick or the corner where the ceiling meets the wall. See how they move to one point on the horizon line. Two-point perspective – An additional line added to one-point perspective that goes to a different point on the horizon line. Texture is the surface quality of an object. A rock may be rough and jagged. A piece of silk may be soft and smooth, and your desk may feel hard and smooth. Texture also refers to the illusion of roughness or smoothness in a picture. Real Texture is the actual texture of an object. Artists may create real textures in art to give it visual interest or evoke a feeling. Real texture occurs only in a three-dimensional sculpture or a collage. A piece of pottery may have a rough texture so that it will look like it came from nature or a smooth texture to make it look burnished. Implied Texture in two-dimensional art is made to look like a certain texture but in fact is just a smooth piece of paper. Like a drawing of a tree trunk may look rough but in fact it is just a smooth piece of paper. Create different types of textures in the boxes below. Explain what the texture is at the bottom of each box. Value is the range of lightness and darkness within a picture. Value is created by a light source that shines on an object creating highlights and shadows. It also illuminates the local or actual color of the subject. Value creates depth within a picture making an object look three-dimensional with highlights and cast shadows, or in a landscape where it gets lighter in value as it recedes to the background giving the illusion of depth. Tint is adding white to a color paint to create lighter values such as light blue or pink. Shade is adding black to a paint color to create dark values such as dark blue or dark red. High-Key is a picture with all light values. Low-Key is a picture with all dark values. Value Contrast is light values placed next to dark values to create contrast or strong differences. Value Scale is a scale that shows the gradual change in value from its lightest value, (white) to its darkest value (black). Create a 5 value, Value Scale. Beginning with the box (below) on the right, leave it blank. That box will be the lightest value of the value scale. The box on the far left will be the darkest value, so shade it in completely black. The three remaining boxes are then shaded in to show a gradual change from the lightest to the darkest values. Form is the three-dimensionality of an object. Shape is only two-dimensional; form is three-dimensional. You can hold a form, walk around a form, and in some cases walk inside a form. Value can imply form in drawings or paintings. Shading a circle in a certain manner can give it the illusion of a sphere. Draw and shade correctly the four basic Forms. What elements of design will be used in your project? How are you going to establish Balance? What is your Emphasis in this Project? How will you establish Emphasis? How will you establish Movement? What type of Pattern will you create? How will you establish Rhythm? How will you establish Contrast? Write a brief statement that explains your objectives for this project. What do you want this piece of art to say? You can also download the Word or PDF versions of this page.